Net approval for Sen. Jon Tester (D-Mont.) fell 18 percentage points since the first quarter, the most among Democrats who represent states President Donald Trump won in 2016. Sen. Dean Heller of Nevada remained the most vulnerable Republican up for re-election this year, with a 2-point net approval. Net approval for Sen. Robert Menendez (D-N.J.) has fallen 20 points since the beginning of 2017 — the biggest decline of any senator up for re-election. 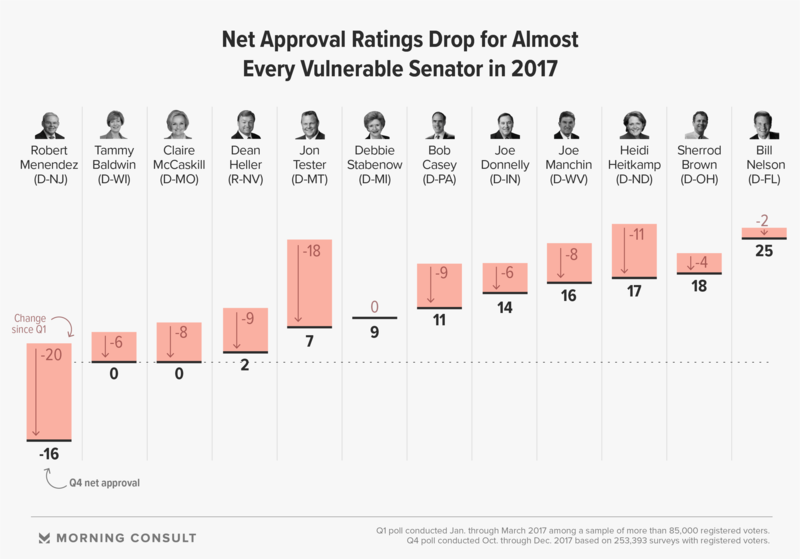 Eleven of the the 12 most vulnerable senators up for re-election in 2018 ended last year less popular among their constituents than at the start of the 115th Congress. The data show declines in net approval ratings for nine of the 10 Democratic incumbents who are running in states President Donald Trump won in 2016, and who have faced attacks on the airwaves and online from their Republican challengers, the National Republican Senatorial Committee and outside conservative groups. Democratic Sen. Jon Tester of Montana — which voted for Trump by 20.5 points in 2016 — saw his net approval rating fall by 18 percentage points by the end of the year, the most of any of those Democratic incumbents, with 47 percent approving of him and 40 percent disapproving, as of the end of December. Much of the decline — 13 points — in Tester’s net rating came during the fourth quarter, with a 9-point slide among independents and 27-point drop among GOP voters. Other Democrats in Trump country who saw net declines during the fourth quarter include Sens. Joe Donnelly of Indiana (-7 points) and Heidi Heitkamp of North Dakota (-6 points). Donnelly’s net approval dropped 11 points among independents and 12 points among Republicans, while Heitkamp’s fell 7 points among independents and double that amount among GOP voters. Despite those dips, Heitkamp, with a net approval rating 17 points in the black, and Donnelly, with net approval of 14 points, are still among the top five Senate incumbents up for re-election this year in Trump-won states. Sen. Bill Nelson of Florida remained the most popular in that group, with a 25-point net approval. Sens. Tammy Baldwin of Wisconsin and Claire McCaskill of Missouri, who are both seeking re-election, remain the least popular Democrats in states carried by Trump, with voters split down the middle over their job performance. Still, midterm dynamics are in Senate Democrats’ favor when it comes to the 2018 ballot: The last Senate incumbent from the party not in control of the White House who lost a midterm general election was Max Cleland of Georgia, in 2002, when then-President George W. Bush enjoyed broad support nationally. Historical data from Gallup shows Bush had an approval rating in the low to upper 60s in the month leading up to the 2002 midterm elections, roughly twice his disapproval rating. On the other side of the aisle, Sen. Dean Heller of Nevada — which Democratic presidential nominee Hillary Clinton won by 2.4 points in 2016 — remains the most vulnerable Republican up for re-election. Forty-one percent of Nevadans approve of him, while 39 percent do not. Sen. Robert Menendez (D-N.J.) got some good news in mid-November when a judge declared a mistrial in his federal bribery and corruption case, but New Jersey voters continued to sour on him. Net approval for the Garden State Democrat dropped 7 points in the fourth quarter, with 29 percent of voters approving of him and 45 percent disapproving. Despite that decline, Menendez held with Democrats — 43 percent approval over the past two quarters. But with a 32 percent disapproval among those voters in the fourth quarter, he could be vulnerable to a yet-to-materialize primary challenge, especially as the Justice Department said it plans to retry his case. Sen. Bob Corker (R-Tenn.) joined fellow retiring GOP Sen. Jeff Flake of Arizona as one of Trump’s most outspoken critics after announcing in September that he wouldn’t seek re-election in 2018. It’s taken a toll on his support in Tennessee, particularly among the Republican base. The Senate Foreign Relations Committee chairman’s net rating among GOP voters plummeted 39 points in the fourth quarter compared to the prior quarter, while his net rating among Tennesseans as a whole fell 11 points. Meanwhile, Corker burnished his standing with the left, notching an 18-point increase among Democrats. He began 2018 with Tennesseans in favor of his performance, 43 percent approve versus 36 disapprove; Republican voters are more split, with 43 percent approving and 41 percent disapproving. In contrast, Democratic voters in Arizona seemed loath to back Flake for his candid criticism of the president through much of last year, but it appears the worm finally turned some in the fourth quarter. 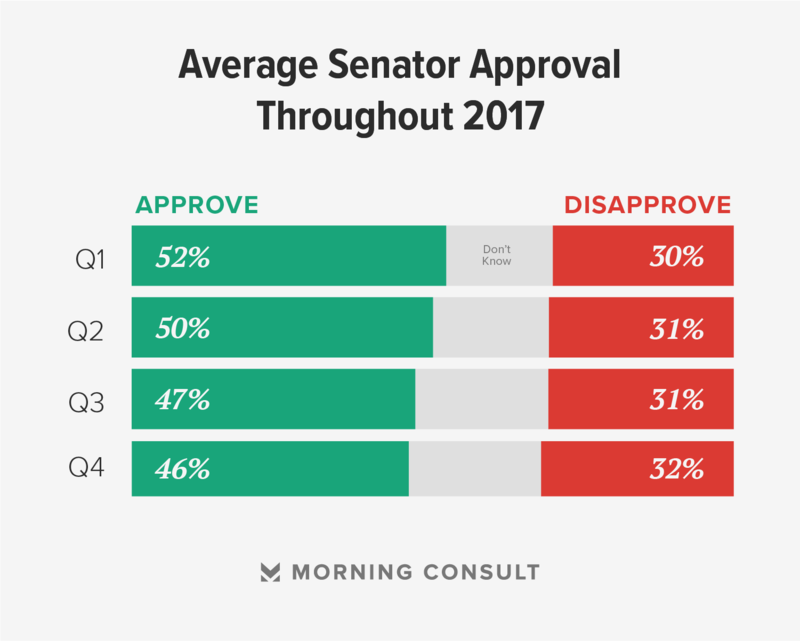 The junior senator from Arizona got an 8-point bump from Democrats, although 49 percent disapproved of him at the end of 2017. But the boost he received from the left pales in comparison to the cost with his base. After a 17-point drop in the fourth quarter among GOP voters, he finds himself 20 points underwater with Republicans, with 54 percent disapproving of him. That makes him the second-least popular senator overall, behind Senate Majority Leader Mitch McConnell (R-Ky.). Thirty-two percent of Arizonans approve of Flake, while 49 percent don’t. Sen. Cory Gardner of Colorado, who is leading the NRSC’s efforts to increase the Republican majority in the chamber, got a 4-point bump in the fourth quarter after being tied for the largest net decline in the preceding quarter: 41 percent of Colorado voters now approve of him while 36 percent do not. Gardner is up for re-election in 2020 in a state Clinton carried in 2016, and he took perhaps the boldest stand among Senate Republicans when it came Roy Moore, the Alabama GOP nominee for Senate who was accused of groping a 14-year-old girl and courting other teens when he was in his early 30s. Gardner was the first member to call for Moore to be expelled from the Senate even if he were to defeat Democratic nominee Doug Jones in the December special election. Jones ended up winning the race.